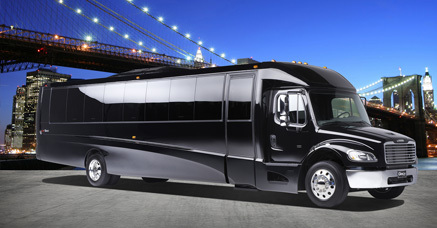 Los Angeles Limousine Service is the leader of party bus rentals in Los Angeles, California. With our well-trained and professional chauffeur, you will get to experience the style, comfort and ease of partying and traveling on wheels. He will make it sure that you and your guests will drop off at the desired location. This way, you will never ever have to worry about the safety of you and your guests. We have a huge selection of party buses that will cover a lot of events in particular with birthday parties, bachelorette/bachelor parties, informal corporate events, proms and more. Our party buses are a one-of-a kind in Los Angeles that will accommodate a lot of people. In addition to that, these are also fully equipped with a leather seating that exudes comfort and elegance. In addition to that, our party buses are preferred for informal corporate events and bachelor parties with their imposing dramatic exterior and interior. They also provide for comfortable seating for the guests around. The most luxurious appearance is also something that is highly appreciated in the party buses. With an emphasis on dynamic lighting, your party will become more exciting and more fun, including the full entertainment system. All your guests will be left entertained, fulfilled and happy all-night. Los Angeles Limo Service provides for the most flexible and most competitive prices for party bus rentals and limo that make them more affordable and more accessible to a lot of people. You will for sure appreciate our company because all we want is to make you feel involved in the party of your dreams. Communicate with us and allow us to help you get the best ride for the event. Good thing, our huge selection of party buses customized for your specific event will meet your guaranteed satisfaction. As mentioned, our party buses are fully-equipped, well-maintained and creatively-designed with 1st class amenities. Our high performance and reliable limos are designed with your comfort and safety in mind. Your dream of partying without any hassle and stress of traveling and driving will simply be brought to you. Modern and clean party bus rentals at their low rental rates are difficult to beat. Browse through our site and call us for suggestions, quick quotes and advice. After you have checked out the videos and pictures, you could now already choose a bus and contact us for lower rates of party bus rentals. There’s no need to hesitate further in booking with us. Our previous clients preferred it using our party bus rentals because they realized that we are after providing a safe, affordably-priced and well-maintained party bus with a fun driver and with a great service. We believe that you will be happy with our party bus service that you will also use it again the moment you have tried it.